Rubi at Espanyol’s training ground. ORIOL DURAN. 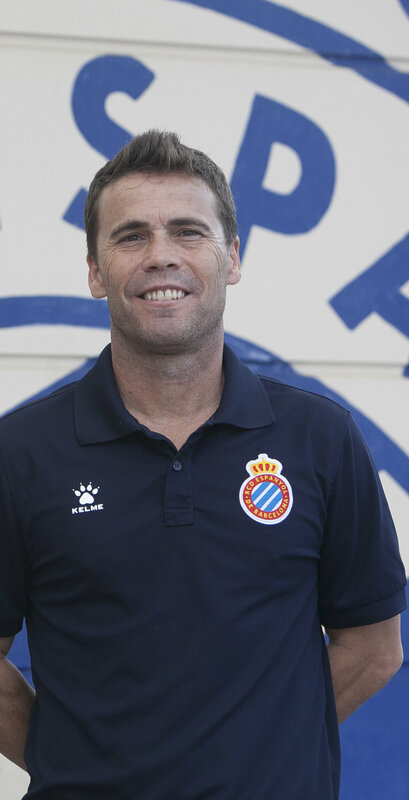 Joan Francesc Ferrer (Vilassar de Mar, 1970) – known in footballing circles as Rubi – is a well-travelled coach and at Espanyol he now has his reward for so many years of work and dedication. His team is playing prodigious football and getting results, and that?s got a lot to do with this coach, who carries a certain air of the eternal teenager due to his youthful appearance. During the interview he is calm, happy and smiles incessantly, like a kid with a new toy. The international break came at a good time after the victory against Villarreal. It was our best game so far and we’re in better shape than at the previous break, when we lost against Alavés and pretty much gave the game away. Now it’s time to enjoy it and work to make it continue. We want more. Do you think praise makes people weaker? This group of players and the people around them, sports and technical coaches, won’t get carried away. When things go well our duty as coaches is to stay alert and the demands are even greater now. We’ve been able to perform at a high level... we must now continue and can’t lose that. When things aren’t going your way, maybe that’s when you’re a bit more tolerant because otherwise you can harm a player mentally. Now we have to be on top of it because our aim is to enjoy more days like these. Did you imagine as good a start to the season as this? I visualised what I wanted from my team but you can’t do it with results. You can’t be thinking you’ll get points here but not there. That never happens. But as an idea, yes. In pre-season I saw a group of players who were eager to make up for last season. I hoped the team would begin like this. It’s the idea of a team we wanted. With the teams I’ve had from the start it’s always gone well: Girona, Valladolid, Huesca last year and I believed this year too. Quique said that this team was “emotionally soft?” Did you find a team with little confidence and low self esteem? I found a team that is eager to work and willing to learn and who make demands of themselves. It’s also true that we have very good players but also great people in human terms, and I’ve been in plenty of dressing rooms. Perhaps that’s why at times this group can be affected a lot by good and positive things, and vice versa. They’re people who care and who suffer for the club. Whenever a new player arrives, the human factor stands out. How does that make your work easier? As a coach it reassures me a lot. I know that if things don’t go well I’ll have people who’ll give me a hand. So the demands have to be high. You have to put pressure on the players because if I didn’t it would be a mistake. But when things are going well all dressing rooms are good, and maybe last year, when they didn’t go so well, having a squad like this helped a lot. That’s why when you have a team like this you have to be careful about who you bring in. Football aside, the human aspect is very important. Lardín was questioned for renewing Javi López and he commented that beyond the quality there was also the cohesion of the group. In football and more so in the first division there has to be a certain level of quality, fitness... In Javi’s case, he has a different problem: he cares about everyone. He has to worry about his own performance but, in addition he worries about his teammates. This is also something to be valued. And in the end we’re always saying that we want home-grown people, committed people, and all players have better and worse moments. But when you have these values you have to take care of them. Then if he doesn’t play well, someone else plays, but he gives you a player who is fully committed to Espanyol and leaves everything on the field. That is undeniable. Is the challenge now to prolong this sweet moment? Many people tell you that you need to make the most of the moment, the good streak. But I always say the same thing: what does that mean? For me the moment has to last all season. Of course, maybe there are two or three games where you only get a point or you’re not at your best, we know that, but what I want, in the normal flow of things, is to maintain this level of play that we’re seeing now. I don’t feel like we have to take the opportunity to get points on the board and then stop doing that in a month. I want the idea to be clear in every match and will stay on top of players to perform at a very high level. That’s my mindset. At home the team’s doing really well but away we’re not getting the wins. It’s a shame, because except for the Real Madrid game we’ve gone ahead in all the games and that’s the hardest thing to do in a match. I’ve told the boys that in recent years they’ve shown they could win away games by scoring the odd goal and making it very difficult for the opponents to equalise. We’re now working on this. And what have the fans said to you? I feel like we’re all very happy and have come here to make the fans happy and enjoy their team. This is the best reward. Now we have the duty to make it last all season. I see Espanyol fans happy even though when we arrived they were a bit down and negative. We can change this, and help them believe and value what they have, a beautiful stadium, a good squad and good players, and that also transfers to the field. The fans are thrilled and more people are coming to the stadium for every game. This is positive and hopefully we’ll get a thousand more each game. The acoustics of the stadium are spectacular. The stadium is only half full and it feels like it’s full. Imagine what it’d be like with the stadium totally full with this feeling we’re generating. It’s the challenge we all have before us: we must continue to play good football and they must fill the stadium.